The longer we mourn David Bowie the more his absence becomes apparent. Nevertheless, in many ways the death of a great rock star nowadays affects only those to whom they were personally close, and makes little difference to most of their fans. Thanks to the heritage industry they no longer fade away: we continue to buy and listen to their records, watch their concerts on screens and read about them as if they were still alive. True, we can’t see them in person any more but, because David Bowie absented himself from public life for over a decade before his death, his actual absence is illusive, like the extinction of an endangered species, regrettable but remote. The obituaries have been written but the books keep on coming. I thought about this a lot as I read Dylan Jones’ David Bowie: A Life, a book I welcome, albeit with some reservations. Though advertised as a biography, it is in reality an oral history, Jones having interviewed and/or solicited contributions from 182 individuals with connections to Bowie; some – like myself – quite tangential and others – like his garrulous first wife, collaborating musicians and long term associates – with much more to say. 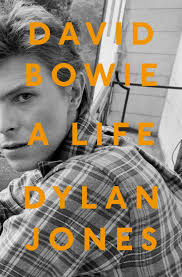 Bowie’s story is told through their words, linked by Jones’ lucid and informative passages that set the scene and hurry things along, and the result is both enlightening and far-reaching, the best text-led Bowie book I’ve read since David Buckley’s Strange Fascination. It’s surprisingly pacy too and, with so many opinions to decode, Bowie’s fluid, restless and magpie-like character is fully developed well before fame beckons. As the present editor of GQ magazine, former editor of a few more and the author of 20 other books, Jones has been awarded the OBE for services to publishing, and his work ethic is clearly Herculean. This book is 556 pages long yet contains no images whatsoever, which is probably a first in the Bowie book industry, and pretty audacious since he remains far and away the most photogenic rock star the UK has ever produced. The format of the book precludes Jones from having to take a view on matters that some fans might find distasteful, thus enabling him to craft a ‘warts and all’ book that manages to avoid the rather prurient sensationalism of several other Bowie biographies I’ve read, yet include the debauchery anyway*. At the same time Bowie’s work is venerated through the opinions of experts: fellow musicians, record producers and prominent persons in the worlds of art and fashion. Some might consider this approach dispassionate but any such charges are mitigated by the scale of the undertaking, not to mention the wealth of information, much of it fresh, that can be gleaned from its pages. “The lack of subjectivity… should enable the truth to shine through,” Jones asserts in his acknowledgements, which is a nice way of saying that many of his interviewees speak their mind without concern for the feelings of others. There was always an element of bitchiness amongst those who surrounded Bowie, at least in the Mainman era and immediately afterwards, and the book certainly benefits from their candour and, probably, creative imagination. In this regard I would question the reliability of certain interviewees, not least a journalist who states that Bowie visited early manager Kenneth Pitt ‘just before Ken died’. I happen to know that Pitt is alive and well, now 95 and well cared for. This is but one dubious statement I found, not many but enough to create concern, leading me to discern a tendency in Jones to value the impact of a juicy quote over its truthfulness, with the old Fleet Street maxim of ‘don’t let the facts get in the way of a good story’ never far away. Bowie himself, of course, was no stranger to this tactic. Touches like this, and what I believe is a scoop about him singing backup on a Frank Sinatra recording during the Station To Station sessions, animate Jones’ book. Nevertheless, there are some important absentees, the missing voices: Iman Abdulmajid, Bowie’s second wife, granted only a few second-hand quotes; Corinne ‘Coco’ Schwab, his über-efficient personal assistant for upwards of 40 years, always a model of discretion, unafraid to offend A-list celebs who request an audience at the wrong moment; and Tony Defries, Bowie’s artful manager during the Ziggy period who, perhaps characteristically, tried to muscle in on the project and, when that failed, invoiced Jones (more out of hope that expectation) for $360,000 ‘for his contribution’. What was that about a leopard and its spots? ‘Never open a door yourself,’ was Defries’ sly advice to the client he signed in 1971, a bright, personable young man terrified he might become a one-hit wonder after his 1969 single ‘Space Oddity’, just about all he had to show for seven years as a professional musician, peaked at number five. Those seven years and the period before, Bowie’s schooldays, are covered well with family, childhood and teenage friends and early band mates, most of them the usual suspects, chipping in. Troubled stepbrother Terry looms large, clearly a big influence, and a contrast is drawn between supportive father Heyward ‘John’ Jones and his mother Peggy who seems like a very cold fish indeed. On the outside Bowie is the model of cool but inside a bundle of neuroses and it was probably desperation that led him to throw in his lot with Defries, a wonderful move in the short-term but disastrous a few years down the line. The colourful Mainman staffers have had their say in other books but it’s good to get them all together again to more or less confirm what we all suspected – fabulous presentation but absolute chaos behind the scenes – and many of their stories still raise a smile, especially as I was on nodding terms with most of them. Photographer Brian Duffy (who died in 2010) hits the nail on the head when he says that Defries ‘realised that in order to get the record company really going, you had to get them up to their neck in debt, which was… a masterstroke.’ It was a bit like a pyramid scheme which imploded leaving many investors skint, and that includes just about everyone apart from Defries and, to a lesser extent, Bowie from whose earnings the profligacy was debited. In the eye of the hurricane, Bowie realised he had to kill Ziggy and in the aftermath his life becomes disordered, as does the book. I was confused by the chronology in the period between the recording of Pin Ups and Station To Station; as if the disarray of Bowie’s daily life between 1974 and ’76, exacerbated by his copious cocaine consumption and the financial fallout of leaving Defries, was reflected in these pages. It’s not as if matters aren’t covered – Diamond Dogs, the ‘theatre tour’, Young Americans, ‘Fame’, the friendship with John Lennon (excellent quotes there), The Man Who Fell To Earth, the ‘Isolar’ tour – just that the sequencing is askew, and not until we reach the recording of Low and subsequent sojourn in Berlin is order restored, just as it was in real life. The Berlin period is fascinating, allowing Bowie to reconnect with reality after the horrors of Los Angeles, though I was surprised that more attention was paid to the cover of Lodger than the music it contained and that, ‘Ashes To Ashes’ aside, Scary Monsters was glossed over compared to the dire Just A Gigolo movie and Bowie’s heroic stage performance in The Elephant Man. ‘Heroes’, the song, gets the full treatment but not much else is said about the experimental music he made with Brian Eno. I don’t believe Jones is being deliberately selective here, just that revelations in the book are contingent on who’s willing to be interviewed, with the result that where witnesses are available whatever they witness gets fulsome coverage, and vice-versa when they aren’t accessible. Thanks mainly to Nile Rodgers no such problems occur with Let’s Dance, Bowie’s best-selling album ever, which for better or worse took him into the mainstream, and plenty of Bowie watchers line up to stick the knife into Tonight, which followed, and also Never Let Me Down. Plenty of associates talk about Absolute Beginners, the movie and the song, which like Jones I love, and he is especially good on Live Aid, which isn’t surprising as his 2014 book The Eighties: One Day, One Decade, focused on just that. Geldof’s charity bash, Bowie’s role in it and its repercussions get an enlightening chapter all to themselves. ‘My biggest mistake during the 80s was to try and anticipate what the audience wanted,’ states Bowie as we move into the doldrums years, followed by the later years when David lived ‘like royalty in exile’, as Jones puts it. Though the 90s were not as interesting as the two previous decades, plenty of people come forward to talk about the less well known music that Bowie recorded in this more settled period of his life, his ongoing need to check out new trends and canny ability to avoid being recognised when he sought anonymity (often by wearing a hat and pretending to read a Greek newspaper), while a few testify to his tetchiness when things did not go precisely according to plan. A surprisingly large number of people met up with Bowie in the period after he abandoned live performance in 2004 to live privately, enjoy his marriage to Iman and raise their daughter, and we learn of projects that were mooted yet not acted upon and how remarkable it was that such secrecy was maintained before the release of The Next Day in 2013. Many interviewees confirm that the rumours concerning Bowie’s poor state of health were ill-founded, at least until the very end, and that he found peace in downtown New York where he could stroll unrecognised into book stores and coffee shops. Almost everyone assumes that his heavy smoking was fatal. * The claim on page 155 by Lori Mattix that Bowie took her virginity when she was 14, sensationalised earlier this month in The Daily Mail as if it was a scoop, is from such an old interview that I honestly can’t remember where I first read it. It has been available to read on the internet for ages. 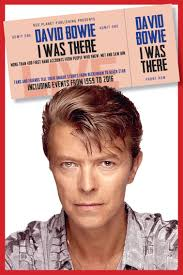 This book follows the same format: a chronology of selected concert dates that were attended by fans and, in some cases, associates of Bowie, who offer their reminiscences of the shows, plus additional sightings of Bowie that merit attention. After a few recollections from teenage friends, among them David’s girlfriend Dana Gillespie (who at 14 looks more voluptuous than many women twice her age), we begin with The Konrads in June 1963 and work our way through to May 2006 when David appeared as a guest vocalist at a David Gilmour concert at London’s Royal Albert Hall. As with the book on The Who, it is the stories from the devoted fans that animate its pages, all of them detailed and affectionate, and in many cases simply offering grateful thanks towards a performer whose brilliance on stage is remembered decades after the event. Some even stray into how seeing and hearing the music of David Bowie had a profound effect on their personal relationships. Between August 1972 and March 1976 I saw Bowie on six occasions – twice in the UK, thrice in the US and once in Canada – and four of these shows are in the book. Among them is the celebrated July 3, 1973, concert at Hammersmith Odeon when David announced the cessation of The Spiders in terms that could be misinterpreted as if this was his last concert ever and not the last concert by the Mick Ronson-led band that backed him throughout the Ziggy era. An element of mystery has attached itself to this episode ever since, specifically with reference to who knew and who did not know what Bowie was planning. Soundman Robin Mayhew, interviewed for this book, has the last word: “Mick Ronson and [crew member] Peter Hunsley were the only ones who knew it was going to happen. Peter told me that David was going to ‘break up the band’ over the intercom just before the last show began.” Just like the lyric then, except that manager Tony Defries was probably in on it too. It is surprising that Neil Cossar couldn’t find a witness to the show at the O’Keefe Centre, Toronto, on June 16, 1974, the third concert in that year’s bold, theatrical and hugely influential Diamond Dogs tour. I was among a party of music writers flown from New York to Canada to report on this and I can still recall my amazement at witnessing a show that paid no lip service whatsoever to traditional rock concert presentation. (I can also remember booking a 4 am wake-up call in my hotel room so as to dictate my quite lengthy report on the show down the phone line to the editor’s secretary at Melody Maker, it being a Monday – press day – and Toronto being six hours behind London.) Still, there is a report on a similar concert at New York’s Madison Square Garden on July 19, which I also attended, but the futuristic staging and props were best seen in a smallish theatre and didn’t really work in a 20,000-seat arena. Not long after this they were abandoned, largely due to the expense of carting them around, and the tour metamorphosed into what came to be known as Bowie’s ‘soul tour’. Another show missing from the book is the one I saw on March 1, 1976, at the Cobo Hall in Detroit, now immortalised as the first ever rock concert that Madonna, then aged 17, attended. “It was a major event in my life,” she said later. “I was wearing my highest platform shoes and a long black silk cape… I don’t think I breathed for two hours. I came away a changed woman.” Regrettably, a similar quote from Madonna is attributed to a concert at the same venue in April 1978, the only mistake I spotted in an otherwise error-free book (unless, of course, Madonna attended both shows, which is unlikely since she moved to New York in 1977). That show was on the Isolar tour, with its dramatic black and white lighting and a besuited Bowie coolly puffing on Gitanes throughout. The ice-blue of the cigarette packet in the pocket of his black waistcoat was the only colour on stage. Though not as visually memorable as the Diamond Dogs show I saw in 1974, from a musical standpoint it was the most enjoyable Bowie concert I ever saw, the Station To Station material translating wonderfully to the stage, along with the same show on March 26 at Madison Square Garden, which is covered in the book. From then on David Bowie just got bigger and bigger, and all the subsequent tours are covered religiously: Serious Moonlight, Glass Spider, Tin Machine, Sound + Vision, Outside, Hours, Heathen and Reality, which takes me up to the last time I saw Bowie, again at Hammersmith (now the Apollo) in October 2002. 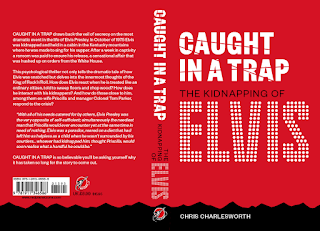 Bowie certainly worked hard, as this book testifies, and due attention is also paid to one-off events such as his four-song set at 1985’s Live Aid – still Bowie’s greatest ever big show concert appearance for my money – the Freddie Mercury Memorial Concert in 1992, and his Sunday night headlining appearance at Glastonbury in 2000. Missing, however, is the Concert For New York City at Madison Square Garden in 2001 when Bowie opened the show by sitting cross-legged and singing Paul Simon’s ‘America’, minimally accompanying himself on an Omnichord, a tiny portable keyboard. This prefaced a reading of ‘Heroes’ that, because he was singing for the firemen of 9/11, just about matched the emotional punch of Live Aid. Either way, Bowie – a consummate professional as well as pioneering visionary – always rose to the occasion when part of a multi-artist bill at era-defining events. It wasn’t quite the end of everything. After a concert at Scheeßel in Germany the following day (not covered here) he was taken to hospital for emergency treatment. He would live on for 11-and-a-half more years and make a handful of guest appearances but his career as a live performer was effectively over from that night. From that point on David Bowie went into virtual hiding, so the book closes with a few random sightings and, appropriately, a series of heartfelt tributes from fellow performers and musical associates. 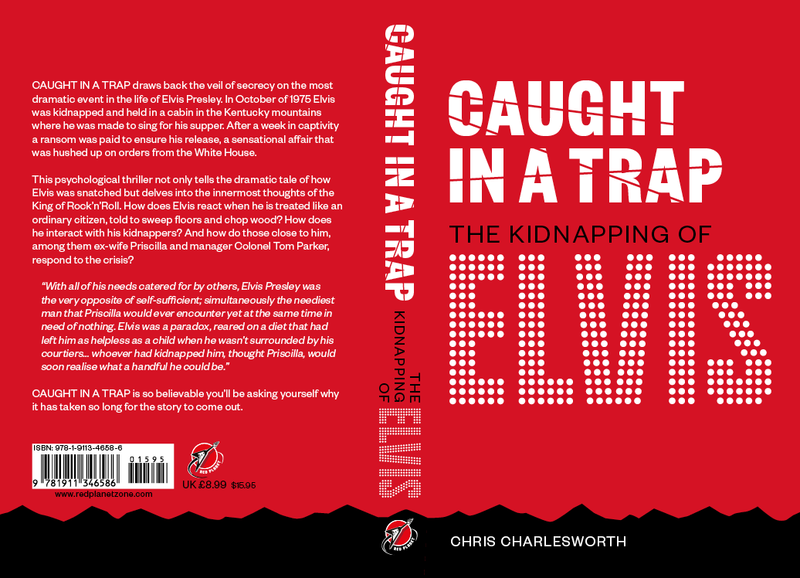 This is the third and final extract from my novel CAUGHT IN A TRAP: The Kidnapping Of ELVIS, which is published tomorrow, August 16, the 40th anniversary of Elvis' death. Until Mark Lewisohn began his detailed investigations into The Beatles, no music writer had devoted more time, words or commitment to chronicling the history of a group than Johnny Rogan with the Byrds. For Johnny, like Mark, it is an ongoing life work, not a project that is over once the book is published but, instead, a kind of mission – I hesitate to call it an obsession – to set down all the facts in all their wondrous detail as they continue to evolve. No surprise then that Johnny has followed up 2011’s Requiem… Vol 1 (1,200 pages), which concentrated on the group, with Vol 2 (1,248 pages), which tells the individual stories of the six Byrds who have left us: original members Gene Clark and Michael Clarke, together with Kevin Kelley, Gram Parsons, Clarence White and Skip Battin. Rogan has written individual chapters, two of them book-length, about all six that could be construed as separate biographies in themselves, yet has chosen to publish them all within the same volume. A bit of history: Johnny Rogan and I first became acquainted in 1982 as a result our association with a publisher called Proteus Books, and neither of us today looks back fondly on this alliance. Johnny had written a book for them on Neil Young and I had written one on Pete Townshend. Both of us were invited to their Christmas party which was held that year in a function room on Sale Place in Bayswater, and we somehow ended up talking to one another while drinking as much free booze as we were able to stomach. Both of us had come to the unspoken conclusion that Proteus was not a company whose ethics were whiter than white, and that taking as much advantage of their hospitality as humanly possible was a prudent course of action. Not long afterwards we sat next to one another at a bankruptcy hearing for Proteus Books held in the ballroom of a hotel on The Aldwych at which the Irish rock photographer Finn Costello raised a huge cheer when he reproached the company’s MD in spectacularly colourful language. Johnny and I were amongst those who cheered the loudest and we’ve been friends ever since. But back to the Byrds. 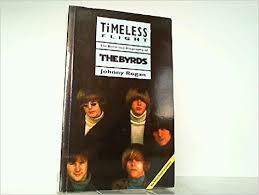 The first edition of Johnny’s Byrds saga, then titled Timeless Flight, was published in 1981 by Scorpion/Dark Star and the second, which I still have, in 1990 by Square One Books. Johnny inscribed this one to me: “No 3 in the charts this week. Beaten out by Omnibus. Fix!” which sounds a bit like a Donald Trump tweet. Neither of these editions boasted the heft of the third edition, Timeless Flight Revisited: The Sequel, which came out in 1997 and, at 720 pages, drew a line in the sand as far as extent was concerned in terms of rock biography. Requiem… Vols 1 and 2 together, of course, make even that look like a mere pamphlet. And now here we are 52 years and five books later, and that’s just on the Byrds. Rogan, of course, has also written 19 other books, eight of which I published while running the editorial department at Omnibus Press. One of them was Morrissey & Marr: The Severed Alliance, the first significant book on The Smiths which, by rock book standards, became an international best seller. Morrissey disapproved of course, though its title – which implied that the Smiths’ singer and guitarist were the key members of the group – was cited as evidence on Morrissey's behalf in the court case brought by drummer Mike Joyce over what he claimed was an unjust distribution of royalties. But back to the Byrds. Because of the way it is structured, there’s no need to begin Requiem… Vol 2 at the beginning, so I didn’t, skipping around at my leisure and relishing Rogan’s absurd attention to detail. In all six cases Rogan has unearthed hitherto unreported facts and stories, most notably on Kevin Kelley, about whom nothing has been published prior to now, and also on the better known Gram Parsons and Clarence White. Nevertheless, whichever way you turn, it’s a rather bleak read, quite the opposite of a fairy tale. Four of the six – Clark, Clarke, Kelley and Parsons – pretty much drank and/or drugged themselves to death, the upshot of the rock’n’roll lifestyle (though in Parsons’ case it ran in the family), while White was tragically killed in a road accident and Battin was a victim of Alzheimer’s. Then there’s the temptations of the flesh that occur around all successful rock bands, and Rogan is especially good at tracing, and telling the stories of the women involved, thus adding a tasty spoonful of human interest that is all too often lacking in rock biographies. Naturally, such overindulgence in just about everything available to them had an injurious effect on their relationships with one another and on those close to the first four, especially their wives, girlfriends and offspring, with the result that recriminations and bitterness persisted for years, legacies were fought over and absolutely no one felt a whole lot better when they were gone. At almost 400 pages*, Gene Clark gets far and away the weightiest treatment, and rightly so in view of the fact that he was the first to leave the mothership; the great underachiever whose wonderful album No Other remains a cult favourite for connoisseurs everywhere and to whom an air of otherworldly remoteness clings to this day. No one better deserves the honorary tribute ‘Mr Tambourine Man’. 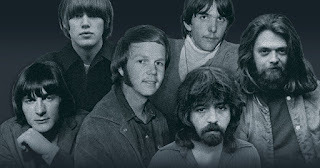 Clark’s tale is perhaps the saddest of the lot, though it’s run a close second by his almost namesake Michael Clarke (135 pages) whose post-Byrds career never really amounted to much and who, like some of the others, later became involved in bogus editions of the group that angered his former colleagues. Bass player Skip Battin, the oldest Byrd by some distance, is a relatively minor figure, another who became involved in later, ersatz, editions of several bands with whom he was associated, including the Byrds. Kevin Kelley, a cousin of Chris Hillman, was enlisted as drummer in 1967, lasted less than a year and worked as a session player between failed attempts to launch an independent career. Rather like the surviving John York, Kelley is a forgotten Byrd who, for much of his post-Byrd life, delivered flowers for a living. 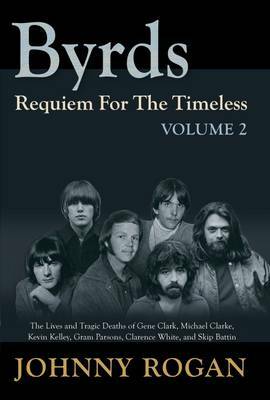 * This includes copious credits, references and notes, over 60 pages following the Gene Clark chapter alone, and there are similar notes, relative in length to the chapters themselves, after the rest. 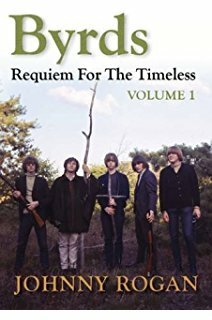 The discography (of solo recordings by all the members of the Byrds, not just the six covered in this book) occupies a further 171 pages at the end of the book.